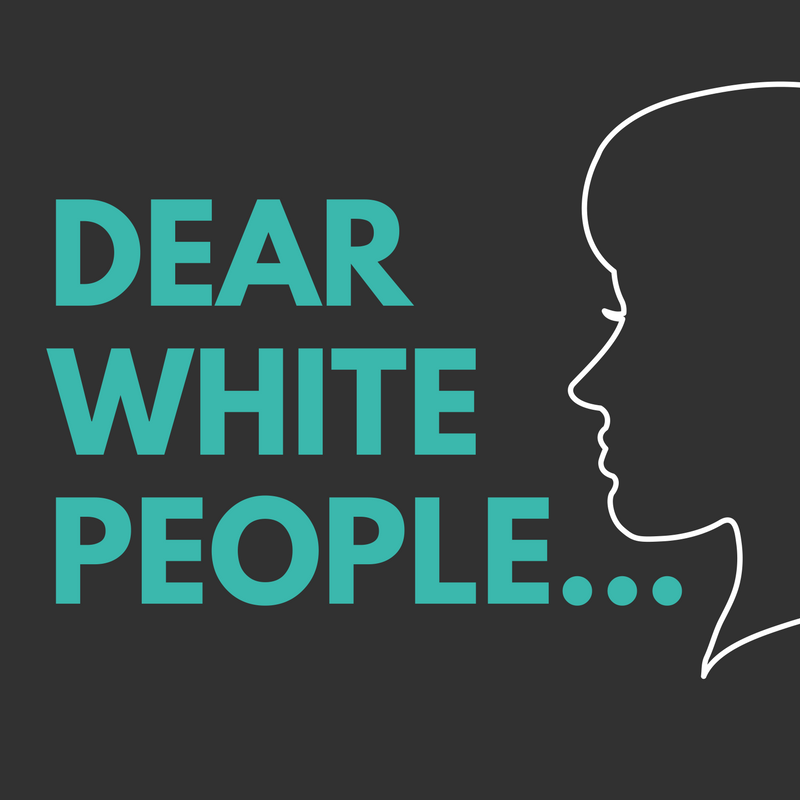 Last week we got real about white supremacy in America. This week we’re continuing our practice AND turning towards signs of resilience that inspire us to keep going. The work of dismantling racism is messy and complicated, but we are ready and capable to step up to our highest human potential. So, we call on our teachers and elders and witches to guide the way forward. We dig deep to imagine better and dream bigger a world beyond oppression. And we turn towards one another in humility and love so that we can continue to learn, grow and transform into the leaders we’ve been waiting for. We are loving this piece by Beth Godbee reflecting the feeling, seeing, doing practice of justice. 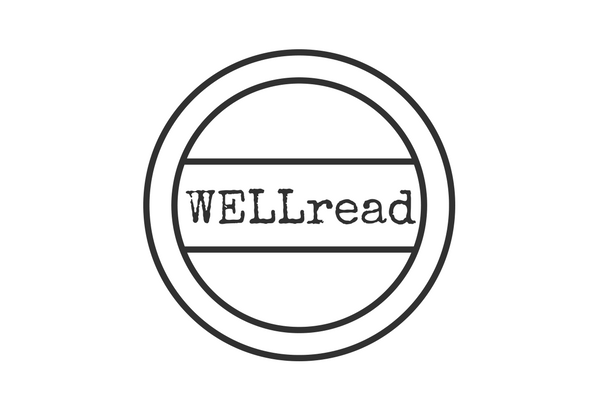 It seems like last week’s WELLREAD struck a chord as it was the most read and shared ever. If you missed it, you can catch up here. It features a powerful selection of voices speaking about our role in liberation work including Ruby Sales, Bell Hooks, Angel Kyodo Williams, Adrienne Marie Brown and more. And it includes a robust compilation of resources and practices to help us combat white supremacy. Some more tips on how to find your voice and have courageous conversations below. Rev. Angel describes this as the “back of the bus” moment of this time and encourages us to contemplate who’s liberation we are really fighting for. Erin Mazursky of Rhize tells us why it’s time to pick a side. 45,000 people eclipsed the right-wing free speech rally in Boston, showing our strength in spirit and numbers. Also, Women are leading the resistance. And we’re not done. Join us at the Women’s Convention as we gear up for our next fight. “Can’t we all just get along?”, “Not all white people are racist!”, “I can’t believe this is happening in America today!”. We’ve all heard them (maybe we’ve even said them). 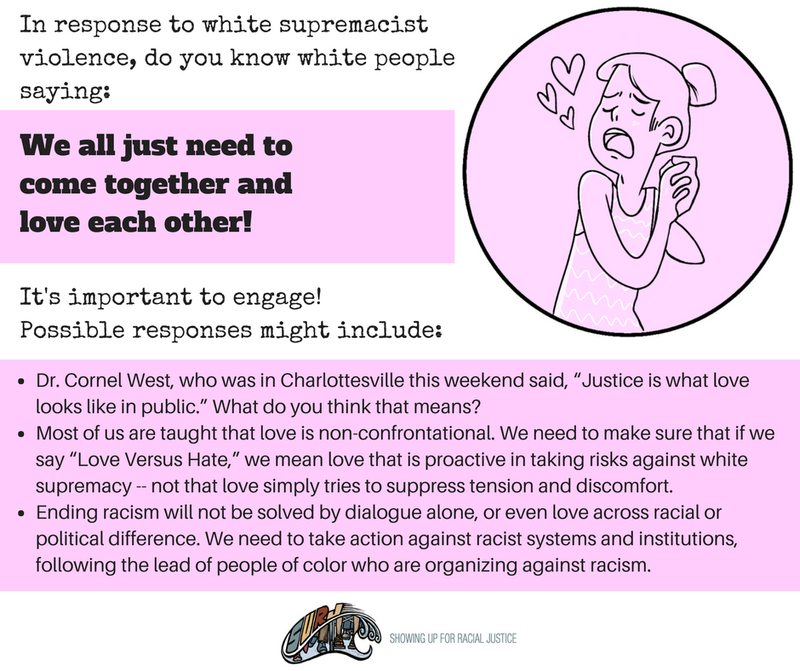 So SURJ (Showing Up For Racial Justice) has put together a handy response guidefor how to disrupt and redirect our conversations towards more productive engagement. Check it out. Practice. And put it into action. Also, our favorite radical copy editor, Alex Kapitan, breaks down “white supremacy” and encourages us to say what we mean and mean what we say. Racism is closer than you think. And if you’re feeling stuck or overwhelmed, Courageous Conversations is a good place to start. Designed to center compassion and relationship in how we engage in tough conversations, this practice guide reveals the ways we are like-hearted, even when we are not like-minded. And tune in Thursday 8–24 for a daring discussion with the Women’s March team about white supremacy. Layla Saad’s raw words call out to us to talk about sacred activism and the role that white women must play in combating white supremacy. Here’s another spiritual wake-up call. And the amazing Octavia Raheem has some fierce and loving words for yogis. Don’t go back to sleep. You asked, we listened. Tune in NEXT WEEK for info on how to participate in our Radical Reading Book Club where we will defer to the leaders and voices (past and present) of the movements of resistance and resilience!